Chair Jenny R. Yang: Will YOU Make the U.S. Equal Employment Opportunity Commission Do Its Job? The U.S. Equal Employment Opportunity Commission's (EEOC) January 21, 2016 Press Release told of the incessant problem of retaliation in the U.S. Federal government. The Coalition For Change, Inc. (C4C), a civil rights advocacy group, asserts that Federal workplace retaliation looms as a domestic threat to the American public. For it injects fear; and too often it silences workers from warning the public of potential dangers. It contributes to the debilitating health of employees charged with upholding the public trust. It adds to the taxpayers' burden. Moreover, it negatively impacts the government's ability to deliver quality, timely and cost-effective programs and services. As noted on its website, the EEOC "is responsible for enforcing federal laws that make it illegal to discriminate." However, statistical data discloses that the Federal agency deserves a failing grade when it comes to achieving its mission. The data also suggests that the EEOC overwhelmingly decides against employees who report violations of our employment discrimination laws. The EEOC's "retaliation-based" charge data reveals from fiscal year (FY) 2011 thru FY 2015 the EEOC found reasonable cause less than five percent (5%) of the time. 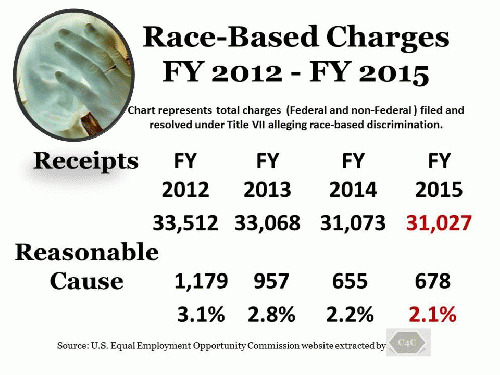 Likewise, the EEOC's "race-based" charge statistics disclosed from FY 2012 thru FY 2015 the EEOC found reasonable cause less than four percent (4%) of the time. Consequently, the EEOC's failure to execute its role with unbiased discernment leaves civil servants, raising legitimate discrimination claims, vulnerable to recurring retaliatory attacks. President George W. Bush signed the Notification and Federal Employee Anti-discrimination and Retaliation (No FEAR) Act of 2002 into law on May 15, 2002 to curb retaliation by holding Federal agencies more accountable. However, the EEOC's lack of oversight and lack of enforcement renders the No FEAR act largely ineffective. 4. Fails to effectively use the Memorandum of Agreement it maintains with the U.S. Office of Special Counsel (OSC) to refer cases, involving violations of Federal laws, for disciplinary action. She's At it Again: Wyneva Johnson, Black AUSA, "Defending Discriminators"
Veteran Affairs Purging Patients, "The Lethal List"
Is the Social Security Administration an Equal Opportunity Employer?